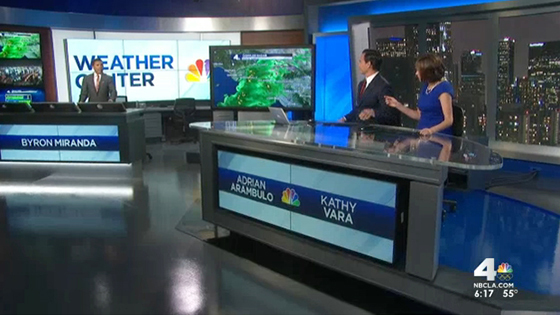 KNBC-TV, the NBC O&O in Los Angeles, debuted its new home from a facility across from Universal Studios. 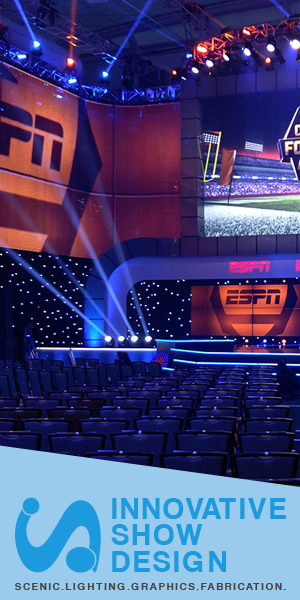 The new set was designed by Broadcast Design International. The move comes after NBC sold its longtime studios in Burbank in 2008 with an agreement to lease back space for “The Tonight Show,” “Access Hollywood” and KNBC-TV and until a new facility could be prepared. 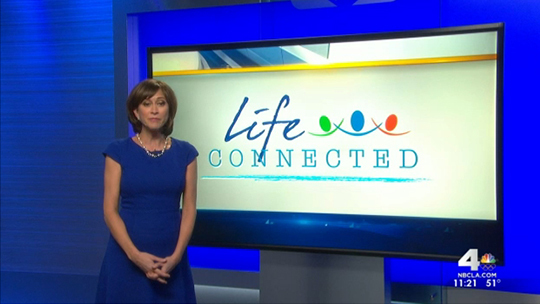 The station’s new set is stocked with flat screen video panels, including multiple ones on the front of the main anchor desk and weather presentation pod. Behind the main anchor desk, vertical screens create the look of a large window, similar to designs used at fellow NBC O&Os WNBC-TV in New York, WMAQ-TV in Chicago and WRC-TV in Washington, D.C., though it lacks the ultra shiny metal finishes found at those stations. Behind the weather area are 2×3 array curves gently behind the talent and is used to display branding graphics and live video feeds. In addition, in some weather segments, the far left panels are used to show current conditions. 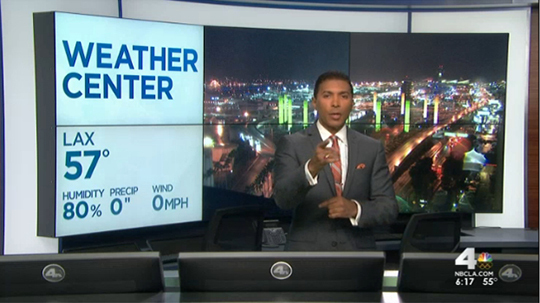 The weather center also features an additional video screen. In an interesting move, the station uses the screens to display talents’ names during wider and push-in shots. This approach reduces on screen clutter, but also conjures images of game show contestant lecterns or school students sitting behind desks with nametags. The set also includes two standup locations, one with a more traditional horizontal video panel for topical OTS graphics, and another with three vertical panels mounted on a freestanding framework, which is also used for sports segments. These areas include backlit panels and additional framework. For more information on Broadcast Design International, visit their website.